My new fave poke place is nestled inside the Lonsdale Quay market, very accessible and convenient from the Seabus terminal. Poke & Co, originally from California, opened in December 2017 and has been a hit since then. 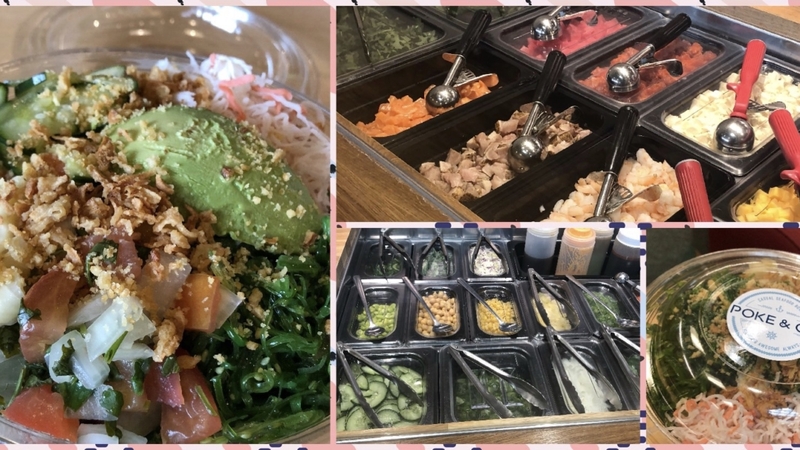 Just like every other poke place, ordering here means you are greeted by an assembly line of base, proteins, toppings, crunchy add on and a few other extras. You can opt to build your own bowl or try their mixed creations with different pre-selected ingredients. There are three main sizes to choose from – small with two proteins, medium with three and large with four. I always opt for the large one with mixed brown rice and salad as base and I usually get the salmon, shrimp, scallops and either the ahi tuna or the spicy tuna for the protein, there’s a tofu option for vegetarians too. The toppings are too many to list down so I just tell them to put everything but the beans (yeah I don’t like beans). There are four main sauces as of this writing – house, ponzu, sriracha, wasabi, I mix and match but every combination seems excellent when paired with fresh seafood and veggies. For crunchy add ons, there garlic, onions, wakame and peanuts, you pay extrat dollar for a slice of avocado, which I always get. If I could eat this everyday, I definitely would! But waistline and wallet complains a lot so I opt for a once a week sojourn. If you’re ever in the quay area, don’t forget to give this spot a visit, you absolutely won’t regret it!